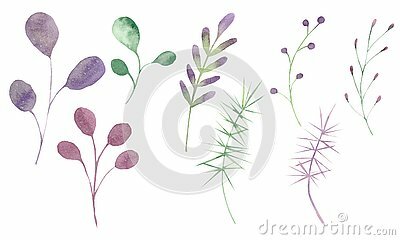 Watercolor set with silver, green, purple, violet leaves and branches on a white background. Ideal for cards and invitations. Set of autumn branches isolated on white background. Hand drawn watercolor illustration. Watercolor roses, leaves, flowers, buds, branches. Botanical watercolor illustration of blue iris with leaves.